Massachusetts State Police are investigating how a motorist drove the wrong-way on Interstate 495 northbound on Wednesday and caused a fatal crash. 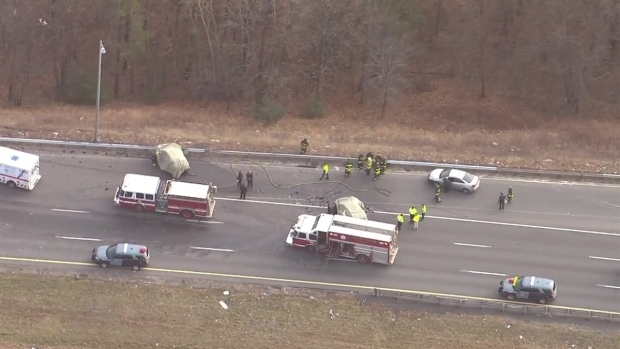 Two people were killed in a wrong-way crash on Interstate 495 northbound in Lawrence, Massachusetts on Wednesday. State police said the multi-vehicle accident occurred at 11:52 a.m. just south of exit 42A. Authorities said when troopers arrived on the scene, they discovered that a Kia Sportage, driven by Jyllian McGonagle, 38, of Lawrence, had been traveling southbound on the highway when she somehow crossed over the median into the northbound lanes of traffic. The Kia sideswiped a Ford F350, driven by a 59-year-old man from Dracut, who was not hurt. Police said McGonagle then struck a Honda Pilot head-on and a Toyota RAV4. Authorities said both McGonagle and the passenger of the Honda, who police identified as Nelson Rivera, 56, of Lawrence, were pronounced dead at the scene. Neither victim has been identified. 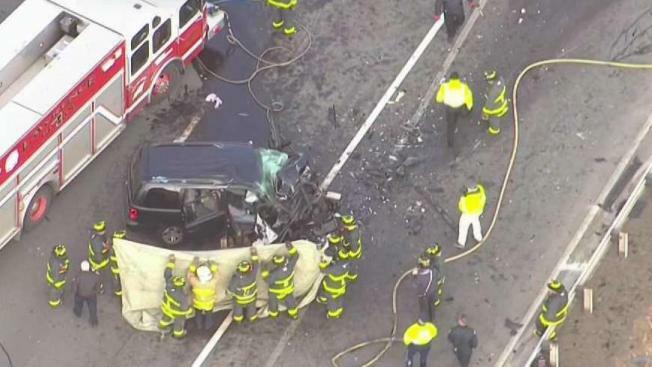 NBC10 Boston's Sky Ranger was over Interstate 495 in Lawrence, Massachusetts Wednesday afternoon where two people were killed in a wrong-way crash. The 55-year-old female driver of the Honda was taken by medical helicopter to Lawrence General Hospital with serious injuries. The 58-year-old driver of the RAV4 and her 27-year-old female passenger were also transported by ambulance to the hospital with non-life threatening injuries. Lawrence Deputy Police Chief Kevin Loughlin said the cause of the crash remains under investigation. "Can't really speculate. Don't know if it's a medical incident or a traffic incident," said Loughlin. "It could be a number of issues." Following the crash, all lanes of I-495 north were closed to traffic for a couple of hours until the scene was cleared. Traffic had been diverted to Interstate 93 to Route 213 and back to I-495. The highway was reopened at 2:56 p.m. The exact cause of the crash is under investigation by Massachusetts State Police.